Some 73% of online adults now use a social networking site of some kind.1 Facebook is the dominant social networking platform in the number of users, but a striking number of users are now diversifying onto other platforms. 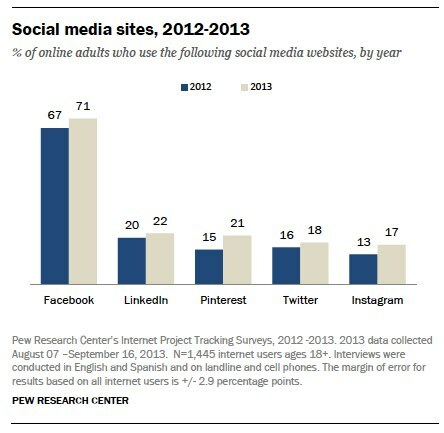 Some 42% of online adults now use multiple social networking sites. In addition, Instagram users are nearly as likely as Facebook users to check in to the site on a daily basis. These are among the key findings on social networking site usage and adoption from a new survey from the Pew Research Center’s Internet Project. As in previous Pew Research surveys of social networking usage, Facebook remains the dominant player in the social networking space. Some 71% of online adults are now Facebook users, a slight increase from the 67% of online adults who used Facebook as of late 2012. While Facebook is popular across a diverse mix of demographic groups, other sites have developed their own unique demographic user profiles. For example, Pinterest holds particular appeal to female users (women are four times as likely as men to be Pinterest users), and LinkedIn is especially popular among college graduates and internet users in higher income households. Twitter and Instagram have particular appeal to younger adults, urban dwellers, and non-whites. And there is substantial overlap between Twitter and Instagram user bases. In addition to being the most commonly used social networking platform of the five we measured, Facebook also has high levels of engagement among its users: 63% of Facebook users visit the site at least once a day, with 40% doing so multiple times throughout the day. Instagram and Twitter have a significantly smaller number of users than Facebook does, but users of these sites also tend to visit them frequently. Some 57% of Instagram users visit the site at least once a day (with 35% doing so multiple times per day), and 46% of Twitter users are daily visitors (with 29% visiting multiple times per day). 42% of online adults use multiple social networking platforms. For those who use only one social networking site, Facebook is typically—though not always—the platform of choice. Overall, 42% of online adults use two or more of these social networks, while 36% use only one (the remaining 22% did not use any of the five specific sites we asked about). Among those who only use one major social networking platform, 84% say that Facebook is the single site that they frequent. However, other “single platform” social networking site users have adopted a site other than Facebook as their platform of choice. Among those who use just one social networking site, 8% use LinkedIn, 4% use Pinterest, and 2% each say that Instagram or Twitter is their sole social networking site. In this survey, we only asked about a subset of the social networking sites that people use. The Pew Research Center’s Journalism Project has collected recent data on the use of other social networking platforms – especially in the context of getting news. To read their material about other sites such as YouTube, Google+, Tumblr, Reddit, and Vine, please go to https://www.journalism.org/2013/11/14/news-use-across-social-media-platforms/. The results in this report are based on data from telephone interviews conducted by Princeton Survey Research Associates International from August 7 to September 16, 2013, among a sample of 1,801 adults, age 18 and older. Telephone interviews were conducted in English and Spanish by landline (901) and cell phone (900, including 482 without a landline phone). For results based on the total sample, one can say with 95% confidence that the error attributable to sampling is plus or minus 2.6 percentage points. For results based on Internet users (n=1,445), the margin of sampling error is plus or minus 2.9 percentage points.